Right now, with summer still fading and the first cool breaths of fall blowing in, you probably aren’t thinking too closely about winter. But when it comes to winter safety, preparation and prevention can be worth more than trying to deal with icy situations when they happen. This absolutely holds true when it comes to car safety during the winter. You probably all know what to do to stay safe on snow-packed and icy roads, and you’ve heard all about how to winterize your home. When winter strikes, even a great deal of preparation can’t always prevent everything. 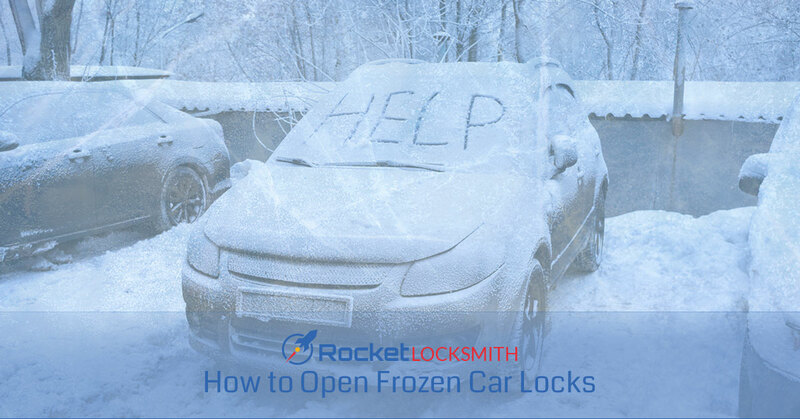 As your local St. Louis auto locksmith team, Rocket Locksmith has some advice for what to do when your car doors freeze. As much as possible, the best way to avoid your car doors freezing closed is to park it in the garage. While the weather is still warm-ish, take the time to clear out your garage, maybe hold a garage sale, and create enough space that you can park your cars in that protected space. Of course, we know that’s not always a feasible option. If you don’t have a garage, or there’s no way you could clear it out enough to park a car inside, there are other options. One easy and inexpensive option is to find an insulated car cover for your vehicle. Online stores or your local car shop will likely have some winter-specific options that will help prevent your car from frosting over. Or, for a more upscale option, you may want to invest in a remote start system for your vehicle; however, be sure to check into local laws to ensure you won’t be ticketed for letting your car idle too long. Give the door a shove – Sometimes, the ice is thin enough that all you need to do is crack the seal the ice created. Start by pushing on your doors to see if the ice will crack and allow you entry. Chip it away – Most of us have an ice scraper. Use that or an old card (like a hotel key card) to chip away at the ice along the door seams and lock. However, don’t use anything metal that will scratch your paint, and don’t use a card that shouldn’t be destroyed, like your debit card or I.D. Fight ice with water – Water is often a good non-corrosive way of melting ice. Just be sure the water is lukewarm, not hot, or you could damage your car. Try a blow dryer – If you have a way to get your blow dryer outside—either a battery powered option or an extension cord—a blow dryer on medium heat can get you inside your car easily enough. Again, stick with medium, not hot, or you could damage your car. Heat the key – This should be used as a last-ditch effort, as this one has the most potential to go wrong. Use a lighter to heat the tip of your key and carefully melt your way to the lock. However, only do this with purely metal keys; the heat will ruin electronic keys. And, of course, be sure you’re protecting your hand against the heated key to avoid burns! If you need other auto locksmith assistance in St. Louis, contact Rocket Locksmith any time and we’ll come as quickly as possible to help you out!